Beach visitors are being "aggressively" threatened with prosecution for taking stones home, it is claimed. Theft had become so common at Crackington Haven, Cornwall, that several signs were put up to warn it is illegal, the parish council said. Visitors could face a fine of up to £1,000 as removal of stones leaves the area exposed to erosion, the clerk for St Gennys Parish Council warned. But critics claimed the signs were "heavy handed" and "spoil the beach". More Devon and Cornwall news. 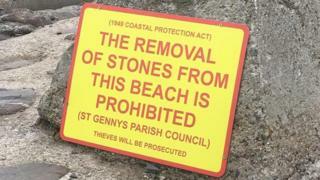 St Gennys parish clerk Barry Jordan said the signs were installed in late July due to many complaints to the council about stones being removed, adding that it was illegal under The Coastal Protection Act 1949. In one case the council traced a holiday maker back to his home hundreds of miles away and he drove "a carrier bag of stones" all the way back to the beach after being threatened with prosecution, Mr Jordan said. "Those who saw the damage of the floods a few years ago know what water can do, take away the pebbles and the haven would be damaged during every storm," Mr Jordan said. Image caption Local people said tourists had backed their view that the signs were "aggressive"
"It's a shame that we must have such a problem with stone theft that the beach is now littered with large red and yellow signs threatening prosecution," local artist Jen Dixon said. "They are so darn ugly on our beautiful beach... It seems very heavy-handed to have that many signs". Local Jackie Carpenter said: "They ruin the 'beautiful place' view and they also provide a horrible 'police-state' sort of environment". Lisa Ward, who also lives in the area, added: "I have overheard visitors walking onto the beach commenting on how 'aggressive' they look". Two of the four warning signs were removed on Tuesday due to a backlash, the parish council said. Cornwall Council, which owns 57 of the county's beaches, said it "strongly urged visitors not to remove stones or sand". A spokesperson said: "It may seem harmless, but given the many thousands of visitors to Cornwall's beaches every year every stone removed could have an impact on coastal erosion, natural flood defences and wildlife habitats". Beaches 'spoiled': Should rock stacking be banned?